The Aurpards were founded in the Age of Myth by the first Venithyan merchants that joined their resources to establish the Gilded Hand cartel. They were the only company to include both the red and yellow of the Gilded Hand heraldry on their own shields and were known as the Gilded Guard. At that time, aurpards, pack felids that prowled the gold-rich Glimmerpeak, posed the gratest threat to the Venithyan convoys on the first leg of their land journey to the Mercurial Gate. It became customary for the Gilded Guard to don the striped pelts of the beasts they killed during their journeys and to depict the aurpard on their shields and helm crests, thus earning them a new name among the Venithyan populace. Expert pikemen, they remained the foremost Free Company as the Gilded Hand turned into an alchemist guild. Through the Age of Chaos, the Realmgate Wars and the Season of War, they continued to unflinchingly serve their masters and to protect Venithya. Their current captain, Aurelian, has reintroduced the practice for parties of recruits to kill an aurpard before they can formally join the Company. Having to work together to separate the beast from the pack, corner and skewer it on their pikes, they develop a spirit of camaraderie the like of which is not seen among other Free Companies. Rightly proud of their skills and heritage, the Aurpards have recently been claimed by Lord Captain Rodrik as his personal bodyguard. Ever since, Aurelian has proven to be an excellent second-in-command and many in Venithya are sure he will succeed the hoary veteran at the head of the city armies. Aurelian's Aurpards are the last human Free Company I'd planned and wanted to be a tribute to the pikemen introduced in the Dogs of War Army Book. 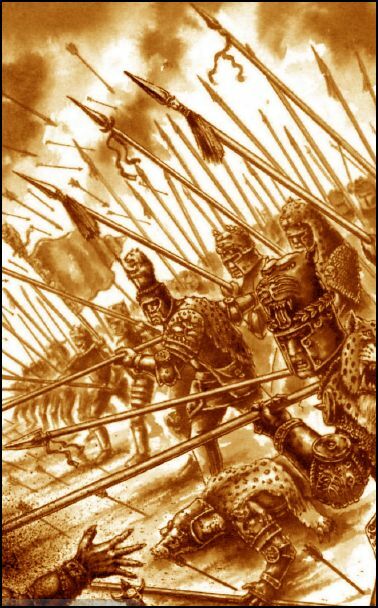 There were many pikemen companies, but I've always favoured Leopold's Leopards, in no small part because of the great illustration that featured in their profile page. On the other side, I found that the original models didn't quite capture the feeling of that illustration, in particular the nobility conveyed by the helms and their crests. So, my objective was to have models that more closely reembled the fighters in the picture. 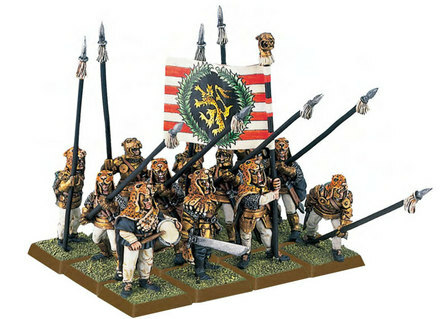 To achieve that, I had avoided using the armoured Freeguild Guard bodies for my other companies. Once combined with the Empire Knights' arms, helms, shields and pelts, I had exactly what I wanted! For Aurelian himself I used the last head from the Freeguild General, the one with the helm sculpted as a felid head with a laurel. I also wanted his pike to look slightly different, so I combined the Empire Knight banner bearer arm with the pike from the really old Unded Chariot (think it was a 1992 model!). The musician and banner bearer required some additional work to give them armoured left arms with weapons, which I made by combining Empire Militia and Knight of the White Wolf arms with spare blades from the Freeguildguard. The banner bearer has a machete-like blade, which was a way to link to Leopold's original model. As always, I tried to give a tribute to the colour scheme of the original models, hence the white trousers. However, since I kept copper or gold armour for my heroes, the Aurpards were given a dull iron armour. As always, the red and yellow tie the models with the other Free Companies, but they are more prominent on them as the oldest Venithyan Free Company. For the pelts, since I'm not good enough of a painter to do leopard spots, I went for an easier striped pattern. And I have to say, I'm rather pleased of how they actually turned out! And with them, my time with Freeguild is over! This project started with the release of Age of Sigmar and the Empire Batallion going on Last Chance to Buy. It feels right that it finishes before the second edition comes out. But do not be fooled, I'm not done with the Free Companies! There are still non-human Regiments of Renown that I want to replicate!